In observance of Thanksgiving Kuna Library will be closed Thursday, November 22 and Friday, November 23 and reopen Saturday, November 24 at 10 am. The library is closing today at 5 pm for our annual staff and board of directors Christmas party. Bring the family to the library see Santa Claus and receive a treat! Don’t forget to bring your camera! A music adventure with Paige Moore. This event is appropriate for all ages and abilities. 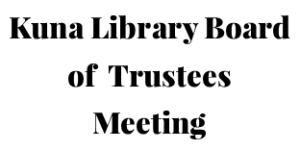 General meetings of the Kuna Library Board of Trustees are held monthly in the Flo Hawkes Trustee Conference Room. General meetings are open to the public. Agendas are posted on our Contact a Board Member page. In observance of Christmas Kuna Library will be closed Monday December 24 and Tuesday, December 25 and will reopen Wednesday, December 26 at 10 am. Players ages 16+ are invited to join us for open session of play. Space is limited to the first 6 players. A free 45 minute exercise class for those 55+. Focus of this class is on strength, balance and endurance. All fitness levels welcome. No library card required. 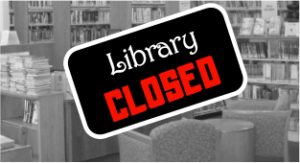 The library is closing today at 3 pm. In observance of New Year’s Kuna Library will be closed Tuesday, January 1 and reopen Wednesday, January 2 at 10 am. Sign-ups for Mayor’s Book Club begins today and continues until the program is full. Open to kids in 4th-6th grade. This program meets once a month at Kuna Library where participants discuss the book with Mayor Stear and the local monthly sponsor. Stop by the library for more information. Games, crafts, S.T.E.M. activities, and guest speakers are among the things planned during our sessions. Activities are geared to ages 5-12 but the whole family is invited to attend. No registration required. Learn to knit at the library with Leah! Students must provide own supplies or may purchase a $10 kit from Leah. Class is limited to 6 participants. Call the library to sign-up.